A dish of Spanish origin. Seasoned deep-fried squids often served as appetizer or pulutan, and served with a dipping sauce. Rinse the squid and drain. Cut into rings about 1/4-inch thick. Squeeze calamansi over the squid. 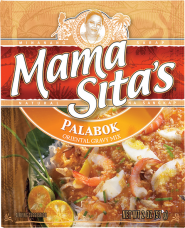 Combine Mama Sita’s Palabok Mix and cornstarch. Roll the squid rings lightly in the palabok-cornstarch mixture. Deep-fry in hot oil until golden brown. Drain. Dissolve Mama Sita’s Sweet and Sour Sauce Mix in water. Boil and simmer, stirring constantly for two minutes. Serve the squid rings with Mama Sita’s Sweet and Sour Sauce and/or Mama Sita’s Labuyo Hot Pepper Sauce.